Moral responsibility is a classic topic in philosophy, but it has various aspects; it can deal with challenges of free will, our moral agency, blaming and praising or something else. This volume touches upon many of the discussion, but it also brings together three fields in recent philosophy and this in turn enables discussions about moral responsibility and agency in refreshing and novel ways. The first field is constituted by the recent accounts of moral responsibility that focus on our interpersonal and social practices (after P. F. Strawson). The second concerns the discussions of relational autonomy and the challenges imposed to it by structural inequalities and social oppression. The third field is based on work in social and feminist epistemology that focuses on the same kind of phenomena as the previous field with an epistemological emphasis. The purpose of the book is to answer why these fields need to be in dialogue with each other and the claim is that the contributions collectively do this. The contributors represent experts from all the three areas in a balanced way even if it is clear (starting from the title of the volume) that the framework for these discussions is shaped by concerns in moral responsibility. Nevertheless, the reader does not get an impression that any of the areas is an underdog, but that the dialogue is summoned equally by all the represented fields. The volume consists of an introduction and twelve chapters, which I briefly introduce individually. Let us start from the beginning. The editors Katrina Hutchison, Catriona Mackenzie and Marina Oshana have put a great deal of effort in the introduction and it pays off. The introduction first provides a historical background of each of the themes and then takes time in linking themes and interweaving the individual chapters together. It is the kind of introduction most, if not all, anthologies should have in providing background for the chapters and mapping out the connections between the individual chapters. To illustrate, one of the overarching issues and the "glue" is language and regarding it more specifically, communication. Other connecting aspects are frequent references to the volume's contributors work in and beyond the volume as well as reoccurring themes such as implicit bias. The three fields could easily remain separate despite seeming attempts to combine them, but the introduction serves its purpose in preventing this from happening in this volume. Michael McKenna's contribution "Power, Social Inequities, and the Conversational Theory of Moral Responsibility" is the first one of the numerical chapters. McKenna points out the challenges of structural inequality to moral responsibility practices and shows how common they actually are. He then proceeds to discuss how the Strawsonian moral responsibility, his own account in particular, can deal with these challenges. Whilst he shows how the conversational account can highlight the social inequality themes in moral responsibility, he points out that the Strawsonian accounts offer little guidance to answering how these inequalities and asymmetrical power relations should affect the moral responsibility practices we have. The next chapter continues with this point. Catriona Mackenzie's "Moral Responsibility and the Social Dynamics of Power and Oppression" starts with P. F. Strawson whose influence on moral responsibility discussions is indisputable. Mackenzie's aim is to show how two recent Strawsonian inspired accounts remain too individualistic and shows the relevance of social oppression and power inequalities to our moral responsibility practices. The chapter has a metafunction, as the two accounts discussed are those of Michael McKenna and Manuel L. Vargas. This adds nuances and increases dynamics to the stated claim of the volume to collectively provide an answer why the three areas should be in dialogue. The third contribution focuses on asymmetries of power and responsibility. Marina Oshana's chapter "Ascriptions of Responsibility Given Commonplace Relations of Power" draws from everyday phenomena in a vivid way. As a meta-note, Oshana's chapter falls between Mackenzie's and Vargas' chapters, but it can also be seen as grounding the theoretical considerations into the social. Her discussion of her own view of responsibility keeps the volume's framework more open. She fleshes out the asymmetries in a way that leaves little room for skepticism of these power structures and asymmetries of responsibility. In the fourth chapter Manuel R. Vargas has the opportunity to argue for his own account of moral responsibility. Unlike the previous chapters, he does so by starting with the traditional free will and moral responsibility tradition. This is, however, useful; instead of starting to build his own revisionist account, he takes time to discuss the challenges of the traditional free will in this kind of a framework. This gives the reader a chance to explore the background of the traditional free will and moral responsibility field whilst at the same time motivating Vargas' own account with culpability questions in partly socially constituted agency. The next (fifth) chapter continues with Vargas' account only to say that this kind of acknowledgement of the social is not enough and continues to point out why this is so. Jules Holdroyd's "Two Ways of Socializing Moral Responsibility: Circumstantialism versus Scaffolded-Responsiveness" compares two accounts, namely Vargas' one and that of Victoria McGeer. Holroyd analyses the accounts in light of the social practices of moral responsibility, and suggests that scaffolded-responsiveness expands the realm of reasons to which we are responsive to. In the sixth chapter Elinor Mason focuses on a theme that has been surfacing in the previous chapters, namely that of (implicit) bias. In her "Respecting Each Other and Taking Responsibility for our Biases" Mason discusses how we should take into account nonparadigmatic cases of blameworthiness. She distinguishes liability from responsibility and argues for taking responsibility. This point highlights the active role of the individual in the social practices of moral responsibility that we have. There is a thematic continuum with Neil Levy's contribution "Socializing Responsibility" from the previous chapter. In contrast to Mason's discussion, however, this chapter extends its scope beyond individuals and adds to the dynamics of the volume. Levy returns to the traditional free will flavored moral responsibility discussions only to point out alternative ways of overcoming well-known free will challenges, e.g. Searle's Chinese room. Levy critically discusses 'the individual' in the standard conditions – control and epistemic – of moral responsibility. He points out that the collectives play a role in the way in which we understand and structure individuals that we are, thus confirming that individuals are inherently social starting from this conceptual level. 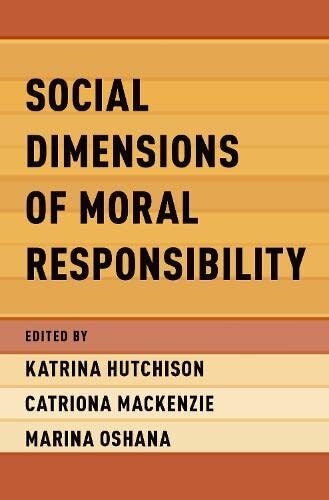 In the eight chapter "Moral Responsibility, Respect, and Social Identity", Katrina Hutchison shifts the focus again to the targets of moral responsibility. Hutchison sets off with P.E. Strawson's objective and participant stances and unravels the seeming polarization of the two stances. She illustrates with difficult, real world, cases that there is possibility to fall in-between of the two stances and suggests that acknowledging and identifying different notions of respect is a useful way to proceed in order to reach plausible ascriptions of moral responsibility. The ninth chapter brings the relational autonomy discussions explicitly back to the dialogical aim of the volume. Natalie Stoljar's discussion about the internalist and externalist accounts of autonomy in her "Answerability: A Condition of Autonomy or Moral Responsibility (or Both)?" could also be seen as an attempt to form a dialogue with the next chapter by Andrea C. Westlund (and with Marina Oshana's account), as Stoljar offers a detailed analysis of Westlund's account of autonomy. She for instance casts doubt in the plausibility of Westlund's account by discussing a historical case of Jehovah's Witnesses in the concentration camps. In the tenth chapter Andrea C. Westlund offers a reading of blaming in light of her dialogical answerability account. The chapter entitled "Answerability without Blame?" is focused on distinguishing not only different types of blame but also different types of functions in blaming. She elaborates on this with the help of cases, e.g. that of personality disorder and "affluenza". The interesting cases tease out the nuances of everyday moral agency and help to distinguish different ways of holding responsible that need not involve verdictive blame. Nevertheless, the way the chapters are set out seems unfavourable to Westlund's contribution due to Stoljar's preceeding critique of her approach. The blame theme continues in the eleventh chapter. Bennett W. Helm's "Personal Relationships and Blame: Scanlon and Reactive Attitudes" is a dialogue between his account and that of Scanlon's. The core issue in this discussion is the role and relationship of the perpetrator and the victim. Helm's own account stems from the assumption that the personal relationship and blame relevant to it should be considers in the framework of community of respect of which members the both parties of the relationship are. In light of the other chapters in the volume, the reader is left to wonder if it is so that personal relationships deem the individuals to the same community (of respect) and whether the membership is equal in non-ideal circumstances. In the last chapter of the volume Maureen Sie returns to the traditional moral responsibility discussion only to argue that instead of focusing on the necessary and sufficient conditions of being responsible we should pay attention to the social function of responsibility practices. The agency we have in our everyday lives is necessarily socially embedded. The chapter resonates with many of the previous chapters, that of Holroyd, in particular, and her discussion of implicit bias further contributes to the volume's joint themes. The volume provides nuanced readings of agency, moral agency and responsibility, deeply embedded and constructed by the social. The ways the authors approach the issues are varied and this may work in favour of the volume's aim. There seems to be many perspectives arguing for the same ends and depending on the reader's background, they may find some more compelling than others. As far as I can see, the volume works for scholars in any of the fields, giving them new scope and context in several discussions. It seems student-friendly as well with its clearly sign-posted and contextualized chapters and dialogues between the chapters. Furthermore, the array of examples is rich throughout the volume ranging from though experiments and literature analyses to analyses of real life cases and documented phenomena. Each of the chapters raise different kinds of questions most of which I have not explored here. The main point of the review is that this is a volume of moral responsibility, social oppression and epistemic injustice and it does collectively answer the question why we should have a dialogue between these fields.